Cobra took lessons from the troopers sent to Sierra Gordo disguised as mercenaries. Following the demise of that amateurish rabble at the hands (or rather machine gun) of Kwinn, Cobra opted to set up a more professional and well equipped team. This led to the establishment of the CUTLASS team - Cobra Unconventional Tactics/Asymmetric Specialist Scouts. CUTLASS are a component of Cobra's Deep Operations Command. 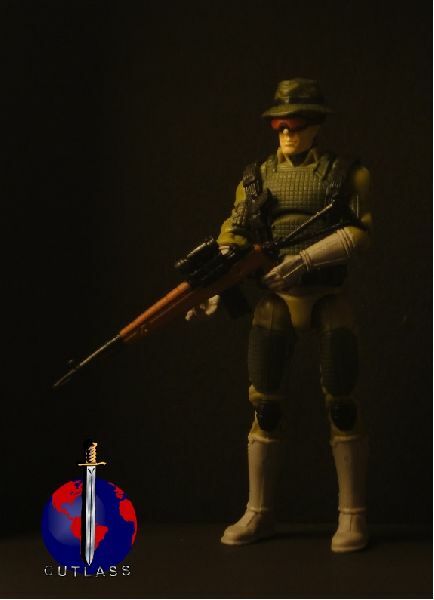 However, they operate at arms length from Cobra itself as a mercenary team called CUTLASS International (Corporation for Utility Training, Liaison, Assistance & Special Security). As guns for hire, they operate alongside or on behalf of one guerrilla / government force or another, all the while secretly advancing Cobra's interests by setting conditions and collecting valuable intelligence. As a Cobra Yeoman (Airmobile) Trooper, Puncture had a reputation for unconventional tactics and remarkable effectiveness as a counter-reconnaissance sharpshooter. He was being courted by the Viper Corps and Xenex alike, but ultimately his independent, go-it-alone personality drew him to the CUTLASS Team. Puncture is a man of few words, but his uncanny awareness of his surroundings and accuracy with a rifle make him a team member trusted by all. Please log in to edit or add tags.